According to his military service records, Jesse Bryant was an 18 year old "Farmer" residing at Winslow in Pike County, Indiana when he volunteered and was enlisted by Sasser Sullivan on August 11, 1862 into what became Company H of the 80th Indiana. Jesse was mustered into the Union Army at the rank of Musician for a 3 year term of service on September 5, 1862 at Camp Gibson near Princeton, Indiana. At that time he was recorded by the Army as being "4 feet 11 inches" tall with "blue" eyes, "light" hair, and a "light" complexion. At that time Co. H consisted of 3 officers and about 95 soldiers. Musician Bryant was assigned to play a fife in the regiment's 18 member band together with William Barr (Co. D), Leonard Cannon (Co. B), Isaac Clark (Co. K), Hugh Daugherty, Jr. (Co. A), Thomas J. Guthrie (Co. C), William P. Guthrie (Co. C), Joseph Hemphill (Co. K), John W. Kellams (Co. D), John C. McConnell (Co. F), William Morrow (Co. I), Israel H. Murdock (also of Co. H), Samuel C. Myers (Co. I), Thomas Nichols (Co. A), William Snow (Co. E), James Watson (Co. G), Leroy Williams (Co. F), and Thomas Williams (Co. B). According to his service records, Musician Bryant was listed as "Present" with the 80th from September 1862 until February 1863. On October 8, 1862, the 80th took part in the bloody fighting at Perryville in Boyle County, Kentucky. This was just 30 days after the regiment had first drawn its uniforms and weapons. During 2 hours of heavy fighting the 80th lost 25 men killed, 116 wounded, and 16 captured out of the 738 men it took into the battle. This was a 27% casualty rate, and amounted to 45% of all casualties the regiment would suffer during its entire service. 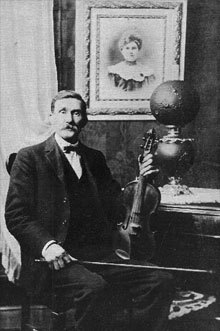 As a Musician, Jesse would probably have been on the battlefield, either playing and/or helping to carry wounded men to shelter. On December 24, 1862, Christmas Eve, Jesse wrote the following from Camp Gilbert at Columbia in Adair County Kentucky to his Mother at home in Indiana. "Tomorrow brings Christmas once more and glad would I be to be at home on that notable day...I do not know how long we will be here but we are ordered to have two days Rations in Haversacks ready to march it may be that we will not have the pleasure of passing the day here." The 80th's official roster lists Musician Bryant as having "deserted" on February 23, 1863 from an Army hospital at Elizabethtown, Kentucky. However, in 1889 the War Department removed the charge of desertion and honorably discharged him from the Army retroactive to February 23, 1863. Unfortunately, Sergt. Brewster died of food poisoning at Louisville, Kentucky about a month after they mustered in (a fact confirmed by Sergt. Brewster's military records and by letters written at that time by other 80th soldiers). According to the family, in February, 1863, Jesse's Mother learned that he was sick at Elizabethtowne and traveled there to see him. It is said that she revealed his actual age, that he had enlisted without the parental consent required for an underage enlistment, and took him home. If true, then this could certainly help explain why the War Department was later willing to give him an honorable discharge. For more about Musician Bryant's experiences during the war, click the 80th History link below to read what happened during for the months he was present with the unit. If you have additional details about him that you would be willing to share, then please contact Scott C. Meeker using the link below. Sources: Genealogical information courtesy of Jesse's distant relative William J. Marshall, and from Cecil E. Goode, author of the book Pike County Kin; Civil War Compiled Military Service Records by Office of Adjutant General of the United States (Washington, DC); and Regimental Descriptive Rolls, 1861-1865, Volumes III, IV, and VIII, Report of the Adjutant General of the State of Indiana (Indianapolis, Indiana, 1866). All Rights Reserved. Created November 19, 2004. Last updated December 7, 2004.